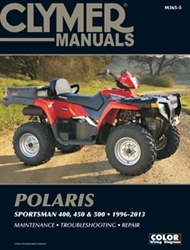 Buy the Polaris Sportsman manual for the 400, 450 and 500 series and learn to perform every service and repair task on your Polaris ATV. Clymer manuals are written for the do-it-yourself mechanic and the experienced pros. This repair manual contains original photographs, illustrations and wiring diagrams obtained from the complete teardown and rebuild of the Polaris Sportsman. This, in addition to extensive research is how Clymer service manuals achieve an unmatched level of detail and accuracy. This book is one of our best sellers and for good reason, Clymer has written this book in such a way that it covers all 3 sizes of Sportsman in a clear and concise manner. Readers can easily identify which section of the chapter pertains to their model. With over 700 pages of detailed instructions and specifications the book is sure to please. Covers all models with EFI. This manual does not cover 500 ATP HO models.